Discussion in 'Picture Frame Design' started by joemillsaps, Nov 21, 2018.
was wondering what kind of surface most framers use on his or her table top for putting Frames together? We used carpet and it is not good. Anyone use felt or butcher paper? Thanks in advance. corrugated cardboard. If we have something real touchy, we put down a piece of the cushy white packing foam. Craft/Butcher paper over the corrugated over plywood. Just don't keep layering paper over paper over paper. All three are excellent for providing smooth, non-abrasive surfaces to lay frames face down on and/or mats on. It's a great chance to re-use and re-purpose before discarding. Also, if something is delicate and/or fragile you can just turn the sheets 1/4 turns without turning/sliding the art/mat/frame itself in some cases. Big table? Just go to the other side and pull all towards you. Plus, I just keep a couple cardboard tubes to roll the sheets into and save. Takes up no space at all. Makes me feel all warm and tingly that they don't end up in the trash right away. on it and cardboard or scuffed matboard, plus my saved carrier sheets. Also, lift up the glass to put drymounted or wet mounted pieces under to dry/cool down flat to help minimize warping. Rolled original or s/n art (as long as no dimension/3D/heavy embossing) can be put under the glass for the week or two until it comes up on your framing queue. Really starts the flattening process. echavez123, Rick Granick and joemillsaps like this. My favorite worktable cover for the past twenty years is white 4 mm Coroplast (aka fluted polypropylene, aka polyflute). The surface is smooth, firm, yet soft enough to avoid damaging frame corners if accidentally bumped. The matte-white surface reflects some light and shows debris/contaminants, but it is non-hygroscopic and can be effectively cleaned using glass cleaner and/or SoftScrub. The plastic surface is like a slightly-self-healing cutting board, so it's much more durable than any sort of paperboard. The best feature is that, unlike paper and cardboard, the fluted polypropylene is non-abrasive, which is important. For about $16 per 48" x 96" sheet, it is affordable. When it gets too cut-up or dirty, just turn it over and use the other side. I generally recommend installing a new sheet two or three times a year. Philliam Phulgor and ckelley like this. Thanks...I will check out a sheet and see how it does. For those that would like to see what others have said; here is four threads from 2012-17 on this subject. We use Kraft Paper over Needlepoint Board. 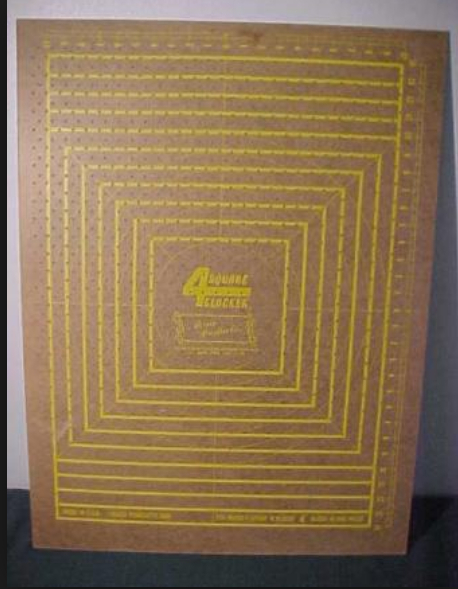 Change out the Kraft Paper regularly. Change out the Needlepoint board every few years or as needed. I've never seen a board for blocking with a grid printed on it. I've always used handmade ones. Needlepoint board is what it is listed as in the Don Mar catalogue. It's a 3/16" dense paper board. 32" x 40". Listed in the catalogue as "buffered, extra rigid non-conservation millboard for mounting or backing. Makes a great table topper. Takes a beating, has a small amount of cushion, doesn't get glass shards embedded in it.